Fists Up – Fight Blight! The bell has rung and our fists are up. The City of Cheyenne is fighting blight and winning! We have to say, as Real Estate professionals we are so appreciative of the City of Cheyenne’s efforts with Fight the Blight. This Task Force has been integral in removing blighted buildings and transforming less than “healthy” properties to being properties that are positive contributors to the area’s market. When purchasing a property it is important to be mindful of the neighborhood and the market values within the region of the property. Buildings that are not taken care of and should be condemned need taken care of in a timely fashion. By leaving the properties “as is” they are deteriorating and only getting worse. Dominic Valdez, RE/MAX Capitol Properties Realtor, served on Mayor Marion Orr’s Fight the Blight Task Force, so watching the progress has been especially interesting to us in the office. Dominic recently gave us an update, the committee was disbanded a while back. We had fulfilled our mandate to give recommendations to the Mayor and City on which commercial properties were considered blight in Cheyenne. It seems the City is acting on many of our recommendations. It was a fascinating process and I appreciated the opportunity to serve in this capacity. The Fight the Blight has taken action on issues such as this. The hope is to increase market values in neighborhoods by removing houses that may be dragging the neighborhood down with safety issues. Some of the property owners of these buildings have been put on action plans to improve and other properties have been full condemned and ownership has been transferred to the City of Cheyenne. Up next is the Hitching Post. 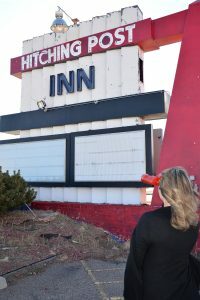 The City of Cheyenne ordered the Hitching Post demolished in December 2018, but the owner filed an appeal in early January 2019. We’ll see what happens next. Do you think something needs to be done with the Hitching Post? If so, what? We want to know your thoughts.